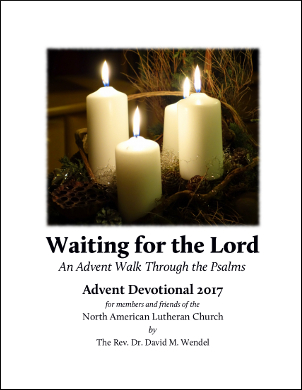 The 2017 Advent Devotional, written by Pastor David Wendel, is now available. Download your printable, one-sided, 8.5″″ x 11″ large print version by clicking here. The 2017 Advent Devotional is also available for your smartphone or tablet by downloading the free NALC Walk of Faith app from the App Store or Google Play. You also may sign up to receive the Advent devotional material as a daily text or email message. • To receive a daily email, please visit: remind.com/join/nalcadvent and complete the brief request. There is a click here button to print a large print version of the devotional booklet, but not for in booklet form. I later found out that I can set up my printer to print it as a booklet. I find the NALC website not user friendly. Every time I go on it, i have to practically click on everything and still can’t find what I’m looking for! I received the NALC newsletter info by e-mail yesterday. After reading about the Advent Devotional I went looking for it. It was not on the page yesterday. As far as signing up to have the devotion sent to you daily, that’s a nightmare for me. Signing up for classes? Having a teacher? No, I just want to receive a daily email. I have signed up for devotions from other websites and it was so easy. Want to receive daily devotions? Watch a Bible Study episode? Put in your email address and tap on the button. TA DA! Thank you for reading my comment. How do I download the nalc app to my android phone? Also, how do I delete the Advent book from my phone. I want to download it from my desk top. Peace as we wait for the birth of the Christ child.